To help with issues you might encounter when installing Office because of slow speeds or unreliable connections, as a first step download the Support and Recovery Assistant for Office 365 tool. If the recovery tool didn't help, follow the steps below that are specific to your plan. You need to be connected to the internet to download this installer file, but once that's done, you can then install Office offline on a PC at your convenience. The steps below differ if your Office product is part of an Office for home or Office for business plan so you need to select the correct tab for your product. Click here to see what products are included in the home or business plans. To download the offline installer, go to www.office.com. If you're not already signed in with the Microsoft account associated with your copy of Office do that now. If you're signed in with a different account, sign out of that and then sign in again with the correct Microsoft account. Note: If you're trying to install Office 365 that you got through your work or school and you already signed in with your work or school account, don't follow these instructions. Select the Office for business tab from above instead. Select Install Office. If you have an Office 365 subscription, you'll also need to select Install Office > on the Installs page. In the Download and install window, select Other options. Check the box Download an offline installer and select the language you want to install Office in. Select Download. When you're prompted, from the bottom of your browser window, select Save (in Edge), Open (in Internet Explorer), Open when done (in Chrome), or Save File (in Firefox). The file will begin downloading on your PC. Once the download is complete, open File Explorer and locate a new virtual drive, for example (D:). This drive contains the Office installation files. If you don't see the new drive, locate the image file you downloaded and double-click it. The new drive should appear in your directory. Note: If you already have a drive labeled (D:), Office creates a virtual drive with the next available letter, which would be (E:) (as shown in the next step below). Save the image: You can also choose to save a copy of this virtual drive to a thumb drive or disc for later use. 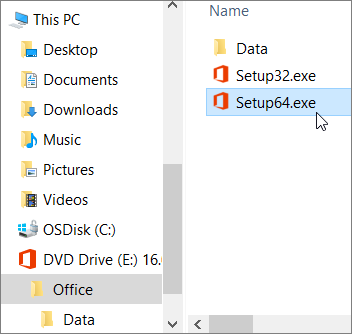 Select the Office folder from the virtual drive and then double-click either the Setup32.exe to install the 32-bit version of Office, or Setup64.exe to install the 64-bit version to begin the offline installation. If you're not sure which version is right for you, see Choose the 64-bit or 32-bit version of Office. When you see the message, You're all set, you can access your Office applications. After your Office installation is complete, you need to activate Office. Be sure you're connected to the Internet and then open any Office application, such as Word or Excel. In most cases, Office is activated once you start an application and after you click Accept to agree to the License terms. If you need activation help, see Activate Office. After activating Office and before you start using it, make sure you have the latest update. In any Office app, for example Word, open a new or existing document, then select File, > Account. From the Update Options drop-down list box, select Update Now. You must have an Office license assigned to you to install and activate Office. To check if you have one, see What Office 365 business product or license do I have? Create a folder on your hard drive and name it ODT. For this example, we'll create it on the c:\ drive, like so: c:\ODT. Download the Office 2016 Deployment Tool from the Microsoft Download Center. Select Save As and save it to your downloads folder. In your downloads folder, double-click the Office 2016 Deployment Tool exe file to install it. If you see the User Account Control prompt that says, Do you want to allow this app to make changes to your device?, click Yes. Accept the Microsoft Software License Terms, and then click Continue. In the Browse for Folder dialog, select the ODT folder you created in earlier, and then click OK.
To find out which Office 365 plan you have, see What Office 365 business product or license do I have? If you're not sure how to decide between 64-bit or 32-bit, see Choose between the 64-bit or 32-bit version of Office. Which version of Office do you want to install? Note: The <Language ID> in the code above is for the English version "en-us". You need to change what's between those quotes if you want to download Office in a different language. If you're not sure what that is, use the URL for this topic to see your language ID, for example, "support.office.com/<this is your language ID>/article". In the text you just copied, replace "en-us" in this line, <Language ID="your language ID" />. Save the file as installOfficeProPlus32.xml in the ODT folder. Click Start, type run, and then select the Run Desktop app to open it. In the Run dialog, type the following exactly as shown below. A blank dialog box appears with c:\ODT\setup.exe in the title bar. The Office installation files should start downloading to the ODT folder on your computer. It can take a while to finish downloading and it may look like nothing is happening while the files are downloading. You'll know the installation is complete once the dialog box closes on its own, and a new folder called Office appears in the ODT folder you created earlier. After the files have finished downloading, open the Run dialog box again. This time type the following. Next, open an existing document or create a new document and select File > Account. Office should automatically activate. 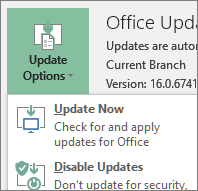 After you activate Office and before you start using it, make sure you have the latest updates. In the same document, select Update Options and in the drop-down list box, select Update Now. If nothing happens, close the application and repeat steps 2 and 3 to update Office from the Account page. Were these steps helpful? If so, please let us know at the bottom of this topic. If they weren't, and you're still having trouble installing Office, tell us what you were trying to do and where you had difficulties. We'll use your feedback to double-check our steps and provide additional information. Save the file as installOfficeProPlus64.xml in the ODT folder. Save the file as installOfficeBusRet32.xml in the ODT folder. If you see the User Account Control prompt that says, Do you want to allow this app to make changes to your device?, click OK.
Save the file as installOfficeBusRet64.xml in the ODT folder.